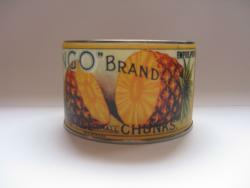 Small label for Cango brand small chunk Pine Apple. Label has 'Empire Produce'. Fits 6cm x 9.5 cm diameter cans.